This is a brief article on affine mappings and their relation to linear mappings, with some applications. To start discussing affine mappings, we have to first address a common confusion around what it means for a function to be linear. In Calculus, a linear function is a polynomial function of degree zero or one; in other words, a function of the form for some constants a and b. 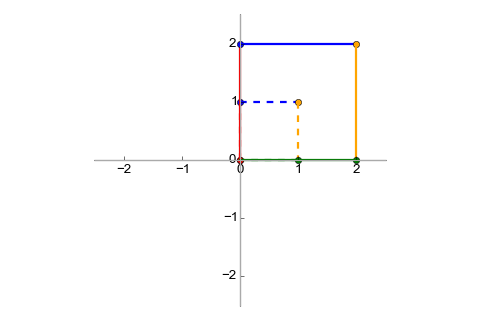 In Linear Algebra, a linear function is a linear mapping, or linear transformation. In this article we're going to be using (2) as the definition of linear, and it will soon become obvious why (1) is confusing when talking about transformations. To avoid some of the jumble going forward, I'm goine to be using the term mapping instead of function, but in linear algebra the two are interchangeable (transformation is another synonym, which I'm going to be making less effort to avoid since it's not as overloaded ). This multiplication by a matrix can also be seen as a change of basis for from the standard base to a base defined by f. If you want a refresher on how changes of basis work, take a look at my older post on this topic. Representing linear mappings this way gives us a number of interesting tools for working with them. For example, the associativity of matrix multiplication means that we can represent compositions of mappings by simply multiplying the mapping matrices together. 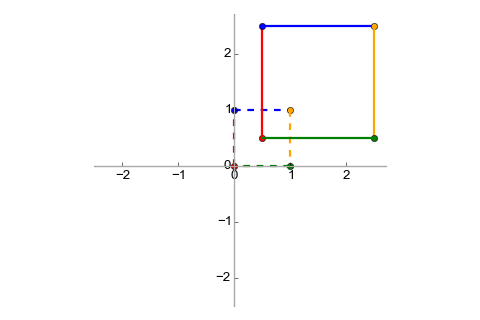 Now that we have some good context on linear transformations, it's time to get to the main topic of this post - affine transformations. is a vector. In other words, an affine transformation combines a linear transformation with a translation. The violation of the scalar multiplication rule can be checked similarly. The translation vector is tacked on the right-hand side of the transform matrix, with a 1 for the extra dimension (the matrix gets 0s in that dimension). The result will always have a 1 in the final dimension, which we can ignore. ... is a geometric structure that generalizes the properties of Euclidean spaces in such a way that these are independent of the concepts of distance and measure of angles, keeping only the properties related to parallelism and ratio of lengths for parallel line segments. Since we've been using vectors and vector spaces so far in the article, let's see the relation between vector spaces and affine spaces. The best explanation I found online is the following. is a vector subspace of . Any vector space may be considered as an affine space, and this amounts to forgetting the special role played by the zero vector. In this case, the elements of the vector space may be viewed either as points of the affine space or as displacement vectors or translations. When considered as a point, the zero vector is called the origin. Adding a fixed vector to the elements of a linear subspace of a vector space produces an affine subspace. One commonly says that this affine subspace has been obtained by translating (away from the origin) the linear subspace by the translation vector. When mathematicians define new algebraic structures, they don't do it just for fun (well, sometimes they do) but because such structures have some properties which can lead to useful generalizations. Affine spaces and transformations also have interesting properties, which make them useful. 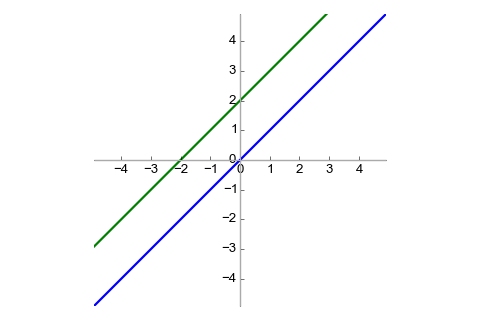 For example, an affine transformation always maps a line to a line (and not to, say, a parabola). 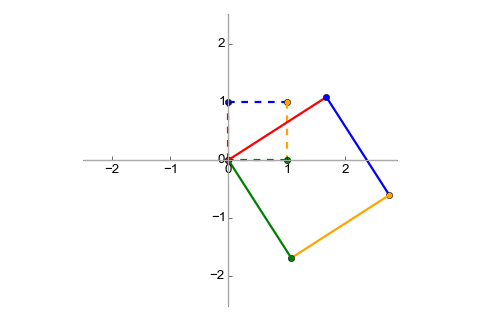 Any two triangles can be converted one to the other using an affine transform, and so on. This leads to interesting applications in computational geometry and 3D graphics. ). Should linear regression be renamed to affine regression? It's probably too late for that :-), but it's good to get the terminology right. is the bias vector. 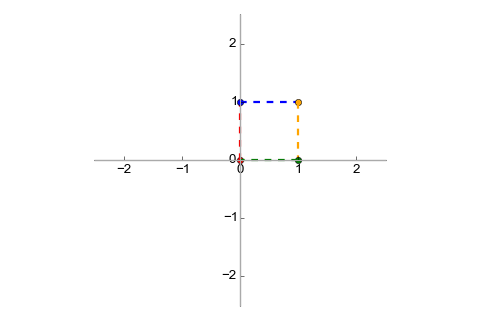 This function is also usually referred to as linear although it's actually affine. Pivoting from algebra to programming, affine functions have a use when discussing one of the most fundamental building blocks of computer science: accessing arrays. Since C's memory layout for multi-dimensional arrays is row-major, the statement in the loop assigns a value to arr[i*N + j - 1] at every iteration. i*N + j - 1 is an affine expression w.r.t. variables i and j . When all expressions in a loop are affine, the loop is amenable to some advanced analyses and optimizations, but this is a topic for another post. Though it's also not entirely precise. Generally speaking, transformations are more limited than functions. A transformation is defined on a set as a binjection of the set to itself, whereas functions are more general (they can map between different sets, for example). 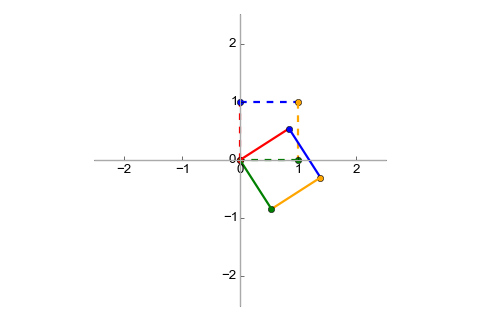 Finite-dimensional vector spaces with a defined basis. when talking about points and lines, but the Euclidean plane can be modeled by a same-dimensional real plane so I'll just be using . I'll admit this result looks fairly obvious. But longer chains of transforms work in exactly the same way, and the fact that we can represent such chains with a single matrix is very useful. 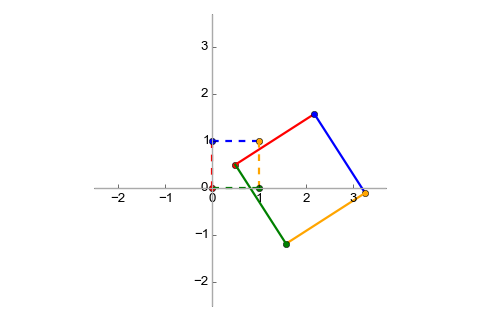 This trick has a geometrical explanation: translation in 2D can be modeled as adding a dimension and performing a 3D shear operation, then projecting the resulting object onto a 2D plane again. The object will appear shifted. It's actually only affine if N is a compile-time constant or can be proven to be constant throughout the loop.